"I'm a bit cautious about source-hunting- though I still think it's legitimate- because I have been criticized for it before, when I was a doctoral student." I was quite suprised by this statement. Before proceeding further though, it must be mentioned that even the Musée d'Orsay quite gladly nominates Cellini's Perseus as an inspirational motif in their online entry for this work. As has been demonstrated in numerous posts at 3PP, one of the overriding themes in art is the use of motifs which often transcend millennia. Symbols from antiquity still resonate in our lives today - such as the caduceus/rod of asclepius used by medical services, or the evil eye charms worn by persons of Indo-European heritage. "We never fully explore the present, the time when the artists painted it and what they would have drawn on to create that composition. We get a snapshot of the patron and that's about it. It seems we are always too busy figuring out how it's different, rather than how it is similar to what went before." -K. Student from US. The factors that shape an artist, particularly in the Renaissance and Baroque are myriad - but finite. It is quite simply impossible to dismiss the history of the era, or the biography of the artist if you want to enable the fullest appreciation of a piece. This may be less the case in contemporary art, but even here one must be cautious to not discard history entirely, depending on the motifs a particular artist is using. Traces of historical symbols are equally prevalent in the works of the surrealists, though less so when you get to Warhol, Pollock etc who deliberately sought to banish historical themes and symbols from their work. We are safely outside the academy here, so let us look at Moreau and see if we can glean some relevant information from his biography. The most telling item would be the fact that in 1841, Moreau(aged 15) and his family travelled to Italy, including Florence - where Cellini's Perseus is located. The sketchbook from this journey still survives and is kept at the Moreau Museum. It would be fascinating to peruse it and see if there was a sketch of Cellini's famous work. 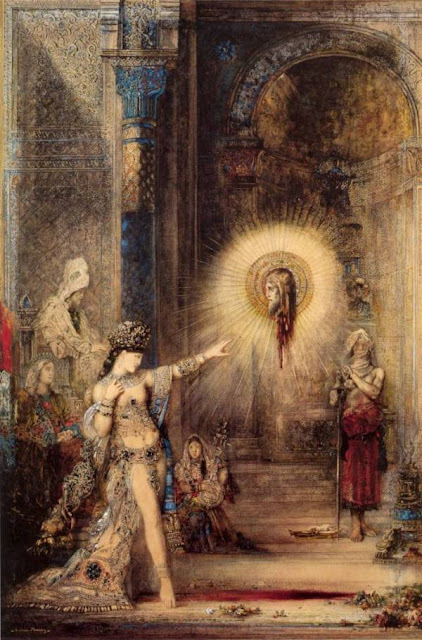 In any event, we know Moreau would have seen this famous piece, and in The Apparition, can see the enduring effect it had on him some thirty years following this journey. This is where I would like to mention the concept of psychosocial inspiration. Whilst others try to convince us of theatricality and absorption in a work, I propose something a bit more straightforward. As a health professional, the term psychosocial is used to define an individual's psychological development as a result of interaction with their social environment. In the case of Moreau, his own family had an interest in travel and the arts, hence Italy became a natural destination. As we have seen in The Apparition, and have the physical remnant of his sketchbook from this journey, this trip had a significant effect on him, as it has done for many art lovers travelling to Florence - myself included. Psychosocial analysis was pioneered by Erik Erikson, and forms the basis of the modern understanding of human development. It moves beyond Freud's limited psychosexual theory, and provides a more complete evaluation of the human experience. I have not seen this approach applied to looking at the development of artists in history. I had a dig around for anything on psychosocial interpretations of art history, and have found nothing - if there has been any preceding work on this, I would very much appreciate it you could let me know. I think it is a fascinating topic worthy of further study. For example, does Raphael's experience of being an orphan by age 11 explain the unprecedented tenderness in his Madonna and Child images? Thinking back on my own experience, even despite some encouraging teachers, my love of searching for historical and psychosocial meaning in art does not come from a text book or lecturer. It was only recently, when reviewing an early post about David Lynch did I realise I was also greatly influenced by scenes from Alfred Hitchcock's Vertigo. In one particular scene, we see Jimmy Stewart following Kim Novak's character to an art gallery, observing her transfixed by a portrait of Carlotta Valdes. We later learn all about Carlotta's history and why Novak's character was so absorbed in the painting. I saw this film in my early teens and find its influence still echoes in my approach to analysing an image. A symbol in art tells a story, to the person who painted it, and the person viewing it. It is simply not enough to focus on the psychological impact of the work on the beholder, but consider the bigger picture and historical factors that shaped the piece. 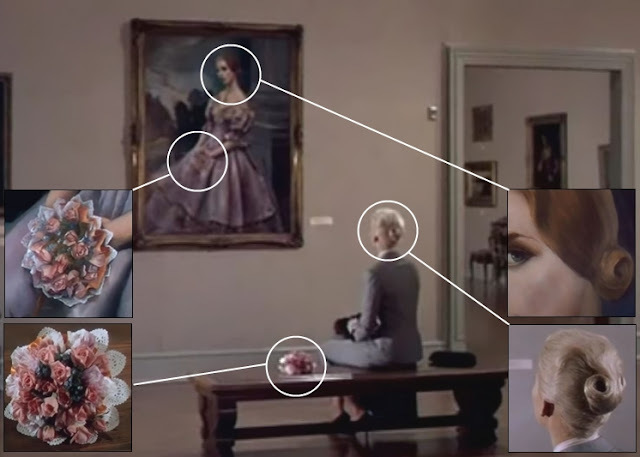 Below is a visual summary of the scene, relating the viewer's obsessive relationship with the portrait. You can watch the sequence here. Hence, a special thank you Alfred Hitchcock for this very early encouragement to look at symbols in art and explore their historical and psychosocial motivations. I hope to return to this topic in greater detail at a later date. My advice to students - please do not limit your focus to the painting and the beholder - it is only a small part of a much bigger picture, spanning eras of time and fascinating detail. Also, if you haven't seen Vertigo, make sure you do so! What a stupendous post H! A quick response, though I'll probably come back to alternative models of history, and reading art, on a companion post I'm planning. I haven't heard of the psychosocial, but found it very interesting. Most of the "psychological" approaches to art history depend on Freud, as you note, although psychoanalysis is laughed at by most art historians. I would be interested in exploring a method that does consider the symbolic in relation to artistic motivation, including the transmission of the symbol, source or whatever. Not exactly Jungian archetype,or even iconography. Something like Hubert Damisch's analytic iconology, - see his book on the Judgment of Paris in art history. I'm particularly susceptible to that as it ties initiation- in an occult sense- in with interpretation, which I was hinting at on the Moreau post. Hypnerotomachia Poliphili on through Rubens. Obviously, biography is important here, although I think Damisch sees it as a cultural story, rather than individual narrative of the artist. Using Wind, Panofsky et al, Damisch does embark on a psychic history of the symbol- interpretation of the recurring source is like probing the unconscious- and comes up with an interesting way of tracking the symbol and cultural referent, though that's not psychosocial. 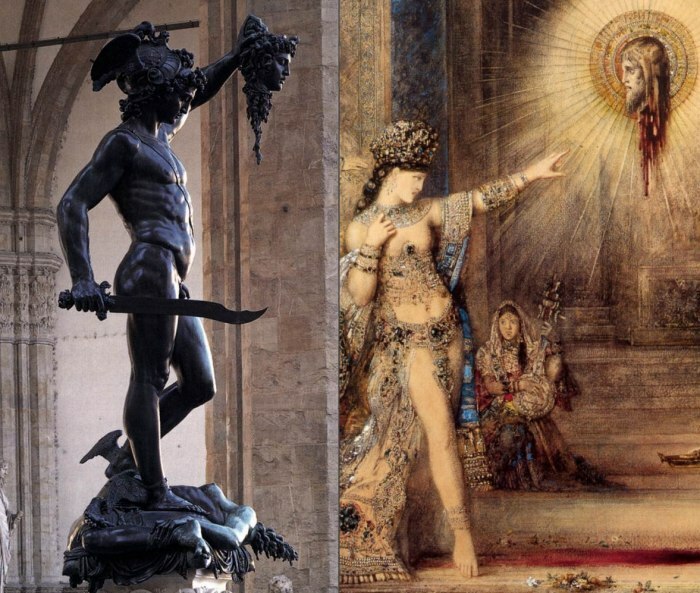 The juxtaposition of Moreau and Cellini seems even more convincing, especially when we learn he visited Florence. Thanks for that, and the link to the Moreau site. Good points on Hitchcock, too. Yes, I’d agree that we can educate ourselves to “read” paintings by looking at other forms of media. As for Raphael and his child images, I’ll be doing a post on how somebody outside art history has interpreted Raphael’s choice of subjects, which should raise a few eyebrows. It’ll be a nice reply to this as it does touch on alternative non-art history readings. When I proposed the topic for my master's thesis, it wasn't easy finding a supervisor. Academics in the History Department were used to privileging textual documents for their evidence - they were not sure at all that paintings, porcelain and silver art provided evidence of any reliable historical data! But like you cited above, the Art History academics were not very interested in my theories about the expulsion of the Huguenots from France, the refugee experience, patronage, court cases, apprenticeship patterns, marriage customs and other questions that I considered critical. @David - thank you for the encouraging words. I most definitely am looking forward to your follow up post(s) and am also eager to look into this in some more depth. Reading Renaissance biographies, there is so much psychosocial evidence sitting in front of our noses, I'm amazed that no one has tried to examine a direct relationship between them and the works produced. Andrew Graham-Dixon's Caravaggio title last year was the closest I've read anyone get to it, but AGD is not a Health Professional so was always on the verge of this identification without actually spelling it out. @Helen - This is a remarkable conundrum. I heard from an entirely separate source earlier this week that "historians don't like images". Couple this with the fact that some art historians seem averse to history, and you can imagine the remarkable opportunities that are being missed, as you have unfortunately experience first hand. It's a terrible shame. Luckily, in the realm of independent online publishing at least, we are free to explore and demonstrate the validity of these connections. It has to start somewhere. The more young people that can be exposed to this more complete approach, the better. They'll very quickly see which is the more useful. Excellent post and discussion. Thankfully I was trained so long ago that history was still a big part of "art history'. So was a discussion of motifs and symbols, art historical precendents, and the artist's biography. It still manages to serve me well in my study/enjoyment of art. I'm delighted you brought up Vertigo since it's a favourite of mine, too, and the way Hitchcock incorporates the Carlotta portrait is remarkable. I teach a class on Art & Film and often show the film. It was a huge influence on the artist/film maker Chris Marker (see La Jetee and Sans Soleil). I'd second David's suggestion (Hugo Damisch). For some reason, I also think you might like Wayne Andersen's work--he's written on Freud & Leonardo, but also very erudite books on the Demoiselles d'Avignon and the Dejeuner sur l'Herbe. He's always excavating the "deep" iconographic roots of imagery. Excellent post. Source-hunting is a red hot potato in academia, a subject I've written on before. I'll send you a copy. Like David I don't know anything about psychosocial development. It may be very appropriate but it should focus on - as you rightly suggest - what artists have in common with each other rather than what is different. That's why Jungian ideas about archetypes and the Collective Unconscious are more useful to art history than Freud's focus on what is specific to the individual. Specialist art historians (practically all of them today) also focus on history and the individual in order to demonstrate how their artist is different from another artist. That's how they claim a monopoly over their area of research and not just in academia but in the trade too where their opinion on attribution can make or break a work of art at auction. The idea that artists from different centuries may have something in common with another is given short shrift today: it would make specialization alone seem inadequate. Actually, Damisch does combine biography and psychoanalysis,and iconography in his little book on Piero- "A Childhood Memory By Piero della Francesca". The starting point is Freud's pyschonarrative of Leonardo, which Damisch plays variations on, in an interesting way. Simon, an chance of me getting of a copy of your thoughts on sources. There is a sub-literature on it in art history. Shearman's "Only Connect" has interesting things to say about it. Thank you for the amazing comments! @Judy - I don't think it was the era you were studying in, you must've struck gold and come across a tutor with a love of history! I understand the art historians engaging online represent the most progressive of their profession, but I'm wondering what percentage they are in comparison to the myriad out in the world charged with shaping young minds? @Ben - your students are probably among the luckiest in the world! An art historian that is so progressive that he not only blogs about their work, his own passions and still can fit in discussion of graphic novels and cinematic influences. Phenomenal! @Simon - thank you for your contribution. It's frightening to hear of this power wielded by people with obviously selfish motives that in the end comprimises students and truncates the historical record. In our own way, the efforts of writers online is a step towards fighting against this. The young people I constantly hear from seem to appreciate it, and that's hope for the future. @David - interesting you mentioned Shearman's "Only Connect" - I was reading Marcia B. Hall's description of it for my upcoming review of her new book. It will definitely check out Damisch, and Andersen(suggested by Ben). Whilst they are not psyschosocial, they will provide context and a frame of reference for future posts. What a fascinating discussion. I'm kind of stunned to learn that there are some who don't believe in looking for symbols/connections throughout eras. No generation exists in a vaccum. I read somewhere that true creativity depends on making connections that have escaped notice before. That certainly applies in the study of art history, I would think! Ha ha - I noticed your little jab at Michael Fried! Like others, I'm not really familiar with psychosocial interpretations either. It seems like art historians might skirt around those issues when they take a socio-historical (or biographical) approach, but probably not completely utilizing psychosocial theory. I'm curious to learn more. And I'm glad that you brought up "Vertigo," too. I love Hitchcock and Jimmy Stewart, which is why "Vertigo" is of my favorite films (perhaps only second to "Rear Window"). I also think that your mentioning of "Vertigo" is telling, since you are also recognizing that one's perception and discussion of art can be shaped by their own life experiences (in this case, your familiarity with "Vertigo"). I realize that you are bringing up the film to emphasize a slightly different point, but I think that this recognition is important: you're recognizing your own background and culture affect your analysis of art. I think postmodern scholars would be happy to see this recognition. Postmodernist scholars look down on source-hunting because they want to emphasize that cultural circumstances affect the viewer's reaction to a work of art (to the point of disregarding what what the artist may have originally intended). Personally, I think there can be a balance between both camps. I believe that it's important to realize that one's ideas are shaped by their cultural experiences/surroundings/biases, while at the same time recognizing that there is much, much value in looking at primary sources and documents. Perhaps, since you mentioned "Vertigo," you also think one could find a balance between both camps? P.S. I've seen your comment on my own blog, and I hope to respond within the next day or so. You've brought up some good point about the Academy in Rome. You posted a comment on my blog several months back and I've been working up courage to find anything even remotely as relevant and knowledgeable to reply back. I can only offer up my profound admiration and respect for your blog. As a lowly second year undergraduate Art History student I have neither the experience or insight that you do and I LOVE reading your blog. I can honestly say I learn more here than I do in most of my Renaissance classes. Drawing parallels from different works and noting re-occurring symbols is one of my favorite parts of art history and it is a shame to hear that some academics tend to ignore this aspect. I also agree that as a student of this discipline, I tend to get very limited background on paintings and patrons. That was why i decided to supplement my Renaissance art class with a Renaissance history class, between the two I managed to get a general idea of the time that artists were working in, but it has left me hungry for more. Thanks you for the amazing feedback! @Vicky- I think these connections seem more obvious to those of us outside the discipline. I imagine the closing off of areas of knowledge in academia has to do with the biases and the 'specialisation' industry Simon mentions above. I'm pleased that other art historians, and blogs such as these are helping broaden awareness that this is happening. @M - This post was in some part fueled by many comments I had received from students who were disillusioned with Fried's work, particularly the Caravaggio volume. One even sent me their copy, stating that it has made them drop out of the theory aspect of art history and made them refocus their studies on conservation. I approached Mr. Fried earlier this week and invited him to an interview, hoping to present a summary of his work in a manner that would make it accessible to students and the public. Sadly he seems to have no interest in communicating with a general audience like Andrew Graham-Dixon or Noah Charney. As for the cultural biases, of course they must be factored in! I look at Caravaggio's 'Boy Bitten by a Lizard' and instantly recognise an ancient mediterranean hand gesture - this came from personal cultural experience, not a textbook. What is great about the potential of the psychosocial approach is that it will incorporate the beholder perception elements *as well as* the social theory aspects. It is truly a unifying construct that has a solid foundation of theory and practise in the health services worldwide. I think it has escaped the notice of art historians because they are not likely to be trained in it as Health workers and counsellors are. @Shahira - Thank you for this amazing feedback! Hearing such things really makes the work I put into 3PP worthwile. I enjoy seeing students tackle art history in their blogs and like to provide input and encouragement as much as possible. I am so pleased to hear that you are supplementing your art classes with a history component. Each will enhance the other in many ways, how fabulous! Good luck! The answer to your question about Raphael is simply that we do not know what effect the death of his mother had on his work. Michelangelo's mother also died at a young age and though he seems to have made reference to her in the Pieta, we just don't know. It is nice to speculate but so many other influences are probably at work. My own mother died when I was 11 but even now I can't be sure of the effect it had on my own life, especially since I was fortunate to have family members who stepped into the breach. @Frank - Thank you for your comment. I must admit, for someone who so readily speculates in their own work (eg. Giorgione's personal awareness of Virgilian themes) that you have cut through Raphael's maternal images with the cold blade of quantifiable logic makes me all the more excited to explore the new framework. This is ultimately what it is about, linking biographical events and themes. There is nothing in Perugino, and only perhaps something in Leonardo that speaks of relevant antecedents Raphael was exposed to. He was never a father, yet we know he was most amorous and passionate towards women. Saying we cannot see traces of these emotional resonances in his work simply means one is not looking hard enough! I try to avoid speculation about Giorgione. I merely said that there is "no evidence"that he was aware of Virgil. It would be hard to make a case for even his knowledge of Latin. About Raphael--so he was amorous and passionate but so what? Most of his contemporaries were. They didn't paint. I think we both agree on the importance of the historical background in understanding Ren. art. Still, the primary source is the painting itself. This is a great article on the true essence of Art History. During my undergraduate degree of Art History I found the same reasoning to be true, especially in the classical literature about art history. Making comparisons between artistics eras was not very well recieved, still today there remains issues. One would hope that art historians might take the efforts of Joseph Cambpell and perhaps recognize the symbolic nature art. One of my last studies was on the comparison between the sculptures of Michealangelo, Rodin and Duchamp. Perhaps that is why I enjoyed the comments about David Lynch and Alfred Hitchcock. Thankyou for writing a splendid meaning of what art history is really about. 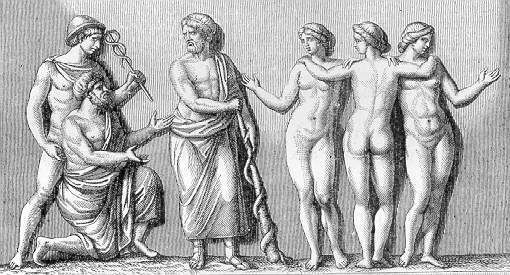 @Frank - a knowledge of Latin is not required to excute a Virgilian motif! More work is coming to light of the role of advisors in clarifying thematic details, classical and sacred motifs to an artist, whom usually were not profound men of letters themselves. By the 1520s of course, we had emblem books being produced as well. Hence, saying an artist's inability to cite the Eclogues by heart is not the final word on whether or not they are capable of representing a Virgilian theme in paint. @Marvin - welcome to 3PP! I wholeheartedly agree about Campbell - his work so eloquently tracks motifs across broad spans of time, and he is celebrated for it! Yet someone trying to do it in art history may be academically discouraged at the very least, or 'viewed with contempt' at the very worst! With more people becoming aware of parallel work being done in the arts and sciences, a deeper appreciation of any given topic will ensue - and that is surely a positive thing!